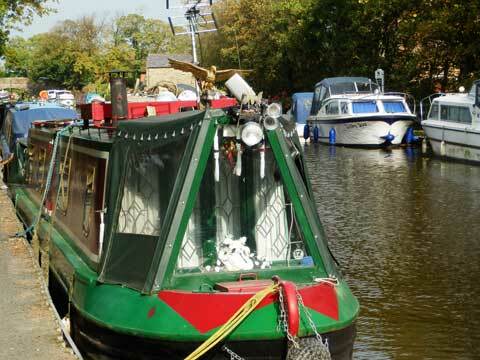 The Lancaster Canal was the idea of a group of businessmen in the Lancaster and Kendal area around 1770. At that time the roads south to Preston and beyond were very poor and goods were transported by river and sea via the River Douglas or the Mersey. The main driver was the transport of coal from the Wigan coalfields and of Limestone and Lime from north of Lancaster. A number of surveys were done and a route from Kendal to around Wigan was planned with possible links to other canals such as the Bury and Bolton, the Leeds Liverpool or the Bridgewater. Also various branches in the north were considered including Kirby Lonsdale and Glasson. 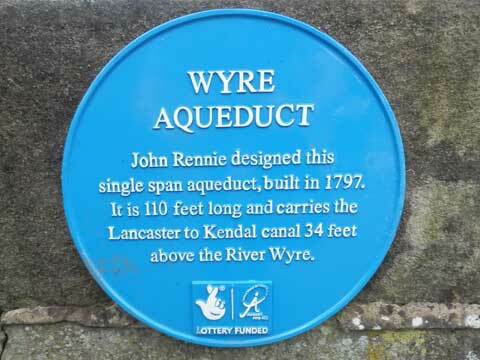 Photo of the Blue Plaque near Guy's Thatched Hamlet where the Lancaster Canal crosses the River Wyre. A company was formed to build the canal and shares issued. Acts of Parliament were passed in the 1790's that enabled the digging to begin. 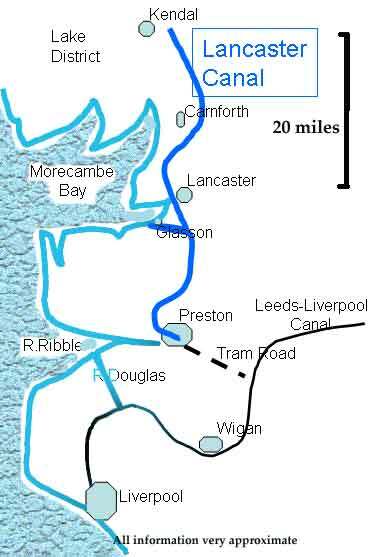 Difficulties were experienced deciding the route crossing the Ribble and the Lune and traffic initially came up the Douglas into the Ribble to Preston. A tramway was eventually built from Preston via Avenham to the Leeds and Liverpool canal at Walton Summit, south of Preston. Also the branch to Glasson Dock and the sea was included. The stretch from Preston to Tewitfield near Carnforth is the longest stretch of canal without locks in the country (ref Lancaster Canal Trust website). For 50 years to the mid 19th Century the canal carried a lot of traffic linking with sea traffic, other canals and later trains. Eventually the train took over after a period of competition and amalgamation of canal and rail companies. Photo of the Lancaster Canal near Guy's Thatched Hamlet, Bilsborrow. The canal was then under-utilised until the late 20th Century when it was tidied and used for pleasure barges. The M6 cut-off the northern stretch. Just north of Preston a new spur has been built to the River Ribble (tidal) linking the Lancaster Canal to the national canal system via the Ribble and Douglas to the Leeds Liverpool Canal. There is a very good book about the canal called Walks along the Lancaster Canal. Most of the book is about the story of the canal with a lot of detail about the business, its costs and competitors. Quite a complex story. My own map of the Lancaster Canal excluding the new Millenium Link which goes to the west of Preston to the River Ribble.